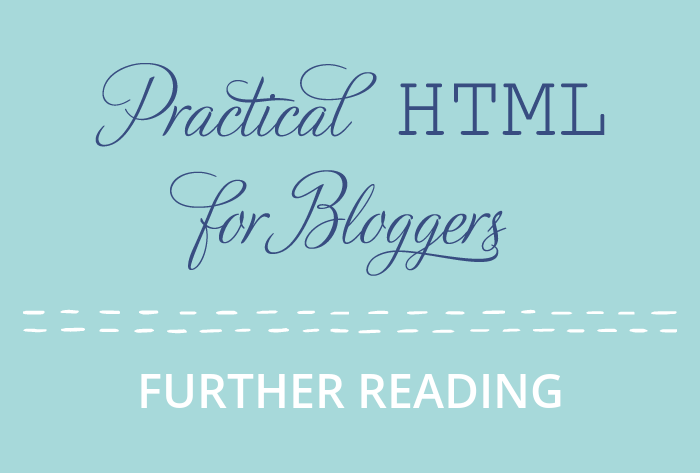 Now that you've finished Practical HTML for Bloggers, you're ready to move on to more comprehensive tutorials in HTML and CSS. There are thousands of tutorials and books on HTML & CSS for beginners, and it can be mind-boggling just trying to figure out which ones to read. So, I'm going to narrow it down to four rock-solid, comprehensive resources that will help you go further into web development. No fluff, just the good stuff! A Beginner's Guide to HTML & CSS: this tutorial series by developer Shay Howe covers the basics of HTML and CSS in a clean, easy-to-read format. HTML and CSS: Design and Build Websites: by Jon Duckett. This is probably the prettiest technical book in the world right now. Its layout is absolutely beautiful and very appealing to visual learners. And, it's not just pretty, it's well-written and comprehensive; after you finish with this book you'll be able to create great-looking static webpages from scratch. Title cards for this series designed by the lovely & talented Jenna from Little Bit Heart.